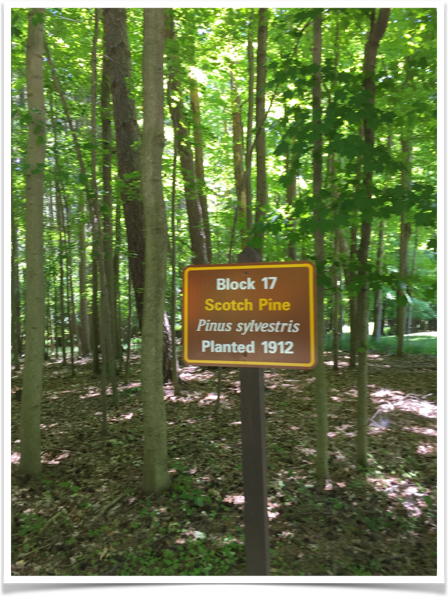 One of the modern signs marking an original block in the Park's Arboretum. More than a century has passed since the Arboretum project began. Not a single scotch pine is visible in Block 17 due to storm damage and construction. Mildred Anderson in her book Genesee Echoes quotes a newspaper statement by Mr Letchworth, “The eight or nine thousand forest trees which I have planted up and down the river in this locality are nearly all indigenous to this soil and have been planted just as the winds of heaven might have cast the seed.” We feel this refers to trees he planted around the estate and along the roadways in common use during the years he managed the estate. When he transferred the property to the state and the American Scenic and Historic Preservation society he gave instructions for planting of areas he designated in conversation with Mr Dow the chairman of the Letchworth Park Committee. Thus when the society began its management this tree planting idea of Mr Letchworth’s was seized upon as a major project that was the focus of attention for many years. The Arboretum is a topic in each annual report from 1912 until the late 1920’s. Early years report on planting progress and methods. Later years give information on care such as thinning, fire damage, which instigated replanting, and mouse and rabbit control efforts. Steam engine sparking caused wild fires that were a major concern. There was actually a Federal agency that insured against this type damage and payment of at least one claim of $500 is reported in the Society annuals. Work by Mr Charles Dow of Jamestown advanced the arboretum even to the extent that he toured foreign countries to view this type educational feature. It appears that it was his idea to plant blocks of trees rather than individual specimens. In the 1911 annual he is quoted: “It will be recalled by the members of the Letchworth Park Committee that at an early conference with Dr. Letchworth the project of establishment of an arboretum at Letchworth Park was discussed in an indefinite way and that a proposition for something of that kind was regarded as one of the possible outcomes of his gift." By 1911 Mr Letchworth had passed away and his deed of gift had been accepted and the management transfer to the Society had taken place. In the 1912 annual report further justification of the arboretum is provided by a statement that during the eight years in which the so-called conservation movement has developed from the germ idea expressed by Theodore Roosevelt before the Society of American Foresters in March of 1903 the people of New York State and the nation at large have awakened to the alarming consequences of the almost unrestrained denudation of our forests. The Letchworth Park Committee obtained assistance from the U. S Forest service. Foresters named Sudsworth and Price were relied upon to plan and carry out the objectives of the Committee. The society reports indicate Price did much of the planning during 1911 but his work effort was cut short by his untimely passing. Sudsworth did a more inclusive job and is found to have issued written reports up until his passing in 1927, just three years before the Society gave up management responsibility. One report in 1925 by Sudsworth reflects his frustration with arboretum operations when he states: "Unfortunately the carrying out plans for thinning has so far proved impossible because the Superintendent has had insufficient funds and time to carry out the instructions with the exception of one plantation." Thinning was an important part of maintaining a healthy arboretum. Here Park workers thin a block near Inspiration Point in the early 1920s. Few images remain of work in the Park's Arboretum. This image is courtesy of Letchworth State Park. The 1913 annual report details the work done in 1912 as follows: The total number of trees planted in the Arboretum is 111,967 of which 55 species are represented with 25 conifers and 30 broad-leaved. Of the 55 species planted , 17 are exotics and of these 8 are conifers and 9 are broad leaved. In 1912 approximately 50 acres were planted. Work in 1913 involved establishing 150 seedbeds. (See photo) The planting of those beds promises one million seedlings. In 1915 ten extra men were hired to fill in places in the arboretum and 199,000 trees were planted. In May of 1916 a cabbage planter was adapted for use with trees and worked so well a second machine was purchased. That month 67,695 trees of ten different species were planted. In 1916 the Jack pine in block 24 was 8 feet tall and white pine weevil was reported in block 20 and mentioned at other times in the reports. An interesting item in an early report was that the Nurseryman, a title sometimes used for Superintendent J.O. Howard, was inspecting all nursery stock from Massachusetts for Gypsy moth, brown tussock moth, San Jose scale and white marked tussock moth. The reporting of 1917 work says the work was prosecuted along established lines and was very successful. Leading to confusion in checking the composition of the blocks was the tendency to fill in where seedlings died. This was done in April of 1917 using 5 different species in blocks 1,3,4,11 & 32 while in May machine planting was begun and 66,000 trees were planted by a crew of three men and two horses. The 1918 report identified 283 species that were established in Letchworth Park. It is noted that this number included seven different species of Ash just to make our study a real challenge. The 1920 report indicated work was hampered by difficulty of obtaining help which is probably a reflection on the effect of World War I. Two acres noted as Block 53 were planted with black walnut, hickory and pecans. Not shown on our maps Block 52 is described as the Old Orchard on the Conway place which was planted with 2800 white pine, Douglas fir and arborvitae. Between May of 1919 and December of 1920 the report states 122,673 trees were planted. The reports of 1922 state that thinning from pine plantations yielded 35 foot tall, 7” diameter trees presumed to be used for posts and rails . A fire in the spring of 1922 killed many trees near the Erie RR. The dead trees were removed and replanted in October with 3500 deciduous trees of tulip poplar, honey locust, black ash and box elder. Fire in April of 1923 consumed blocks 38 and parts of 39 and 40 which had been planted in 1917 with red pine Austrian pine Engelman spruce, arborvitae and Lawson cypress. At that time an arrangement was made for patrols in April, May and October by railroad and park men. The report for 1924 described the black locust planting near the Labor center was ruined by borers and was cut down. We are sure this is when the managers learned of the fierce resprouting of black locust. The species exists in that area to this day with some large specimens. In the spring of 1924 a planting of 1000 Engelman spruce was made in the flats near Chestnut Lawn which is known as Block 55 but was never shown on maps that are available today (1916). They were spaced 12 feet apart each way with the intent to plant Douglas fir between them. 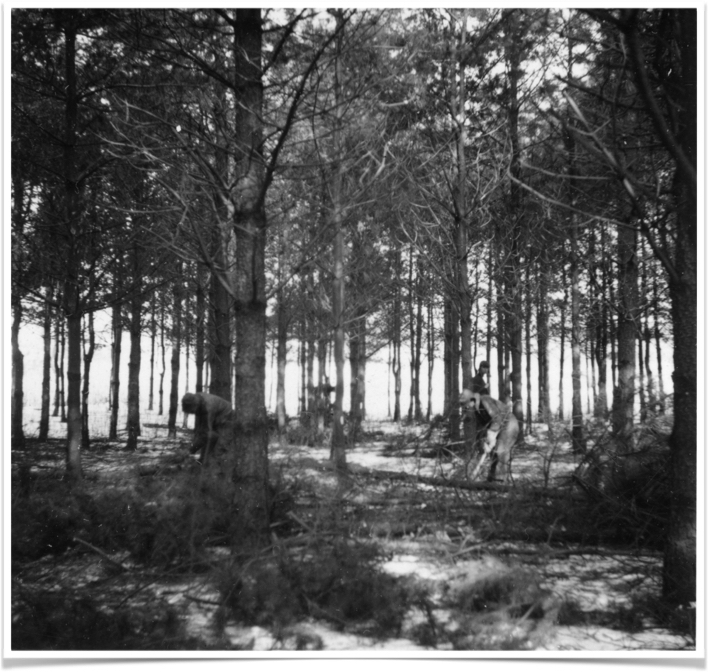 Later 3000 trees were planted but the species is not identified. At this time it is noted in the report that Chestnut blight is spreading rapidly in the park. The park map shows in green the broad view of the area that constituted the arboretum. Enjoy your study of the Arboretum-- The American Scenic & Historic Preservation Society claims it is the only Forest Arboretum in the World.